The Rebel Sweetheart. 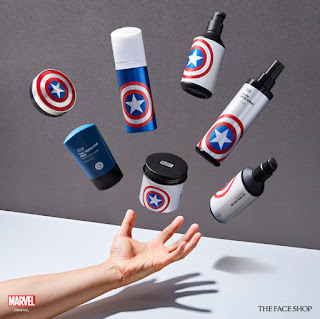 : Sneak Peek | The Face Shop x Marvel Collection. Heads up, comic geeks! And beauty junkies, too! The Face Shop has just launched their summer collection, and this has got to be the fiercest, most bad-a** collaboration collection in the K-Beauty market just yet! 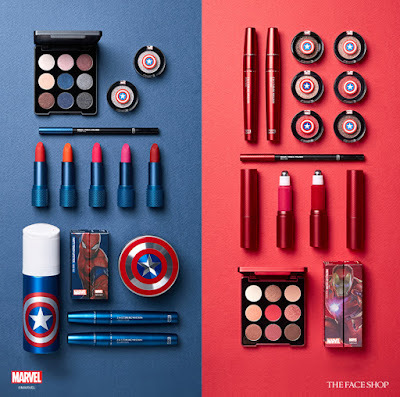 From the lovely Disney princesses to the cute and colorful Trolls, The Face Shop now joins forces with comic book giant Marvel to bring us The Face Shop x Marvel Collection! The Face Shop x Marvel Collection. Available for a limited time only, this recently-launched collection features an array of eyeshadows, eyeliners, mascaras, lipsticks, and nail polishes. 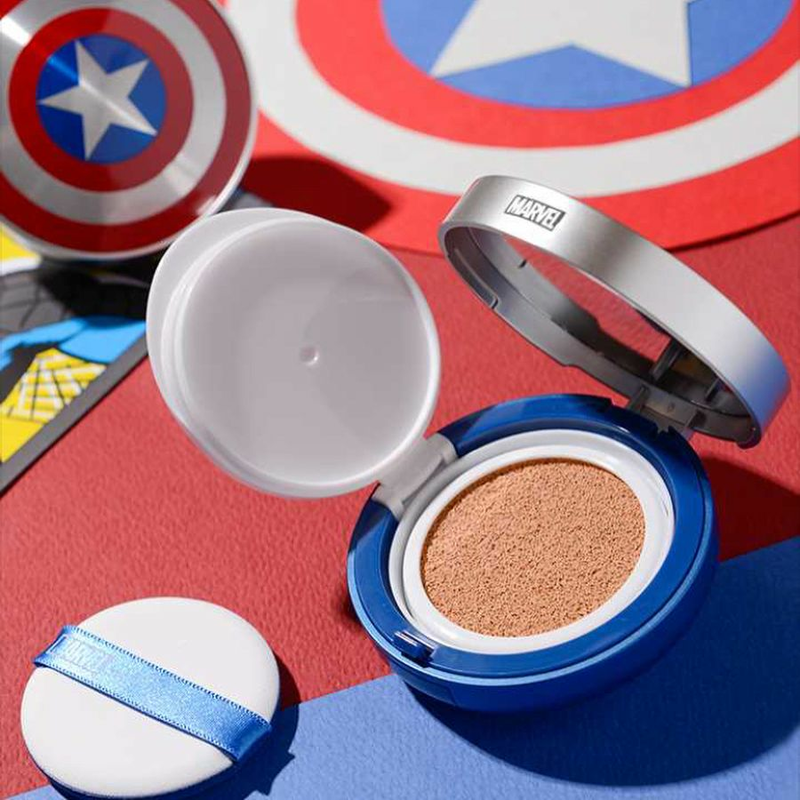 Also included is a Captain America-inspired cushion, and a complete skin care line for men. The Anti-Darkening Cushion, which bears semblance to Captain America's shield, covers blemishes and other skin imperfections without darkening the skin. It gives the skin natural-looking coverage and sun protection (SPF 50+ PA+++) at the same time. Mono Pop Eyes and Single Shadows. The eyeshadows, on the other hand, come in single pans and palettes. 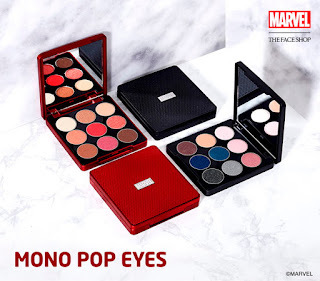 While the usual Mono Pop Eyes palette usually comes with eight different shades, The Face Shop x Marvel Mono Pop Eyes palette contains nine different shades of matte and metallic colors. 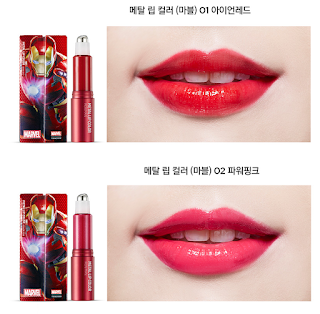 Mono Pop Eyes, 20000 won. 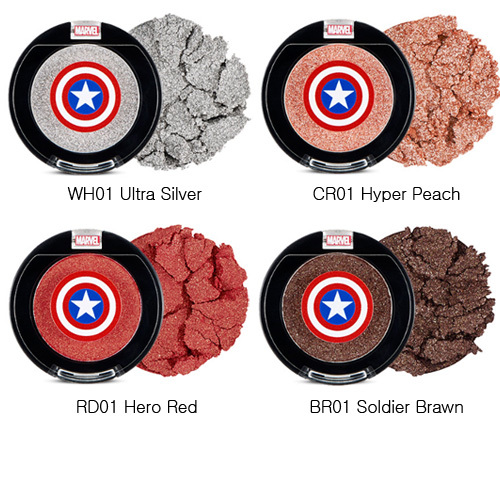 The Single Shadows come in four different 'jelly' colors, all with metallic finish. Single Shadow Jelly, 5500 won. The 2-in-1 Curling Mascara is my personal favorite. It comes with 2 brushes - a big brush, which combs and curls the top lashes, and a slim brush, which combs the lower lashes and the hard-to-reach lashes in the corners of the eyes. 2-in-1 Curling Mascara, 15000 won. The 2-in-1 Curling Mascara comes in 4 different colors, and each color has an Ink Gel Pencil Liner counterpart. This long-lasting, smudge-proof eyeliner has a creamy, gel-like texture which creates vivid color. 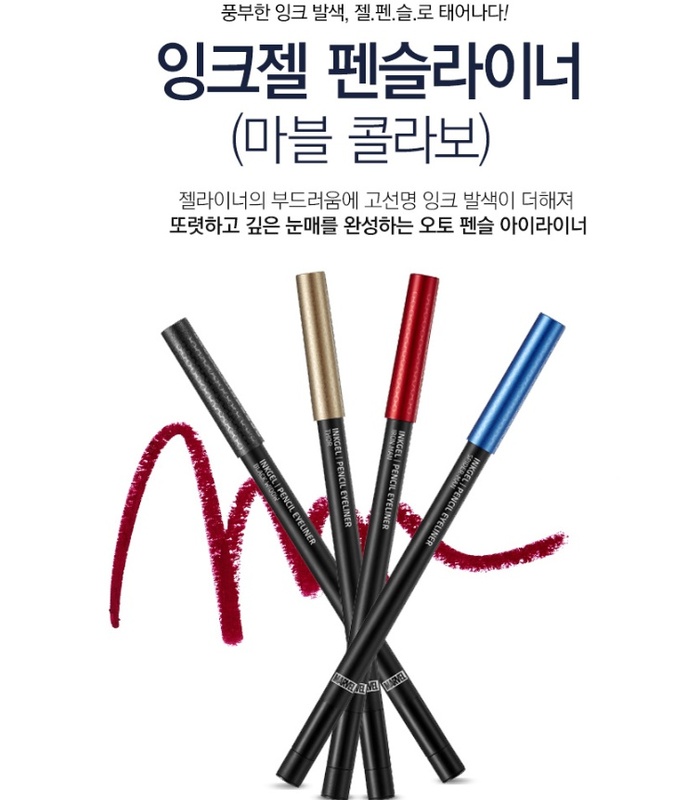 Ink Gel Pencil Liner, 8000 won. The lip products, meanwhile, come in two variants. The Matt Touch Lipsticks, which come in blue Spiderman packaging, have a soft, matte finish; the Metal Lip Color, which come in red Iron Man packaging, volumizes the lips and gives it a brilliant, glossy finish. 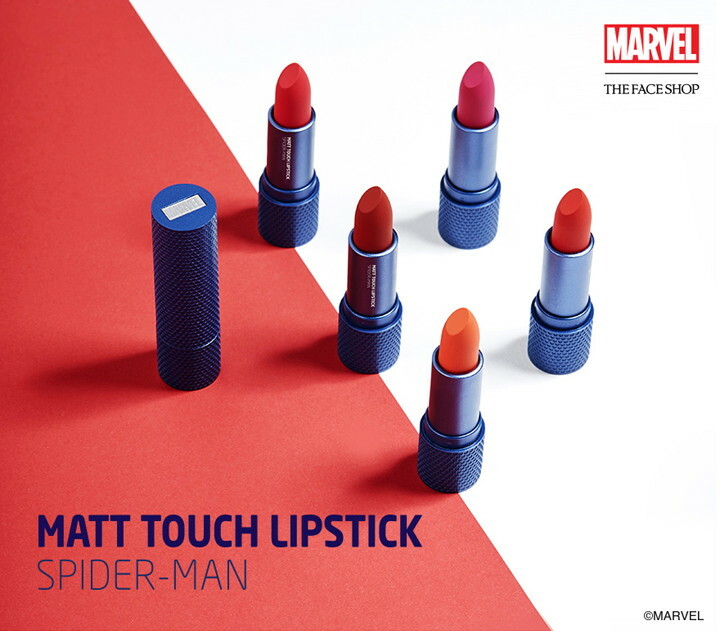 Matt Touch Lipstick, 12000 won. 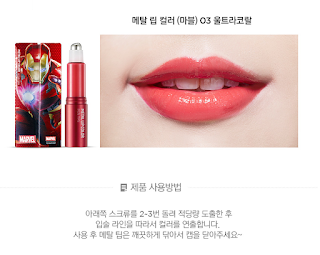 Metal Lip Color, 12000 won. 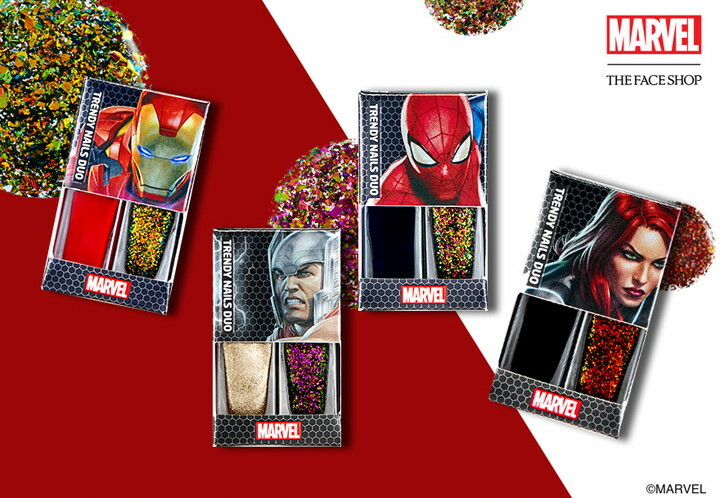 And then there's the Trendy Nails Duo, a 2-in-1 kit with glossy and glittery colors. Trendy Nails Duo, 6000 won. Completing the collection is this skincare line for men, which includes a Toner, Hydrating Fluid, Fix-On Water Spray, Sun Cream, Sun BB Cream, and Hair Wax. 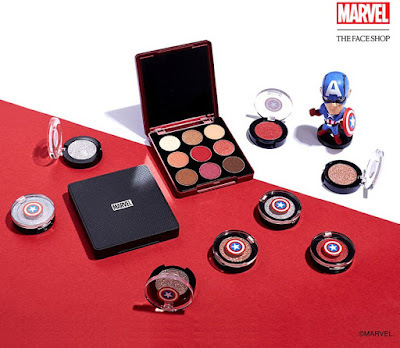 The Face Shop x Marvel collection is now available at The Face Shop stores in South Korea, Thailand, and Singapore. I love makeup and especially themed makeup. This is really cool, I love all of the little details in each product. I wish these products were available in my area! 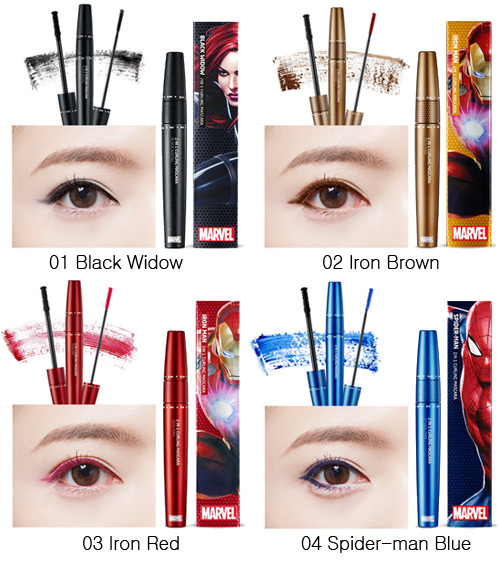 I would love to have the single pan eye shadow (Hyper Peach) and the 2-in-1 Curling Mascara with an Ink Gel Pencil Liner. These are so cool. 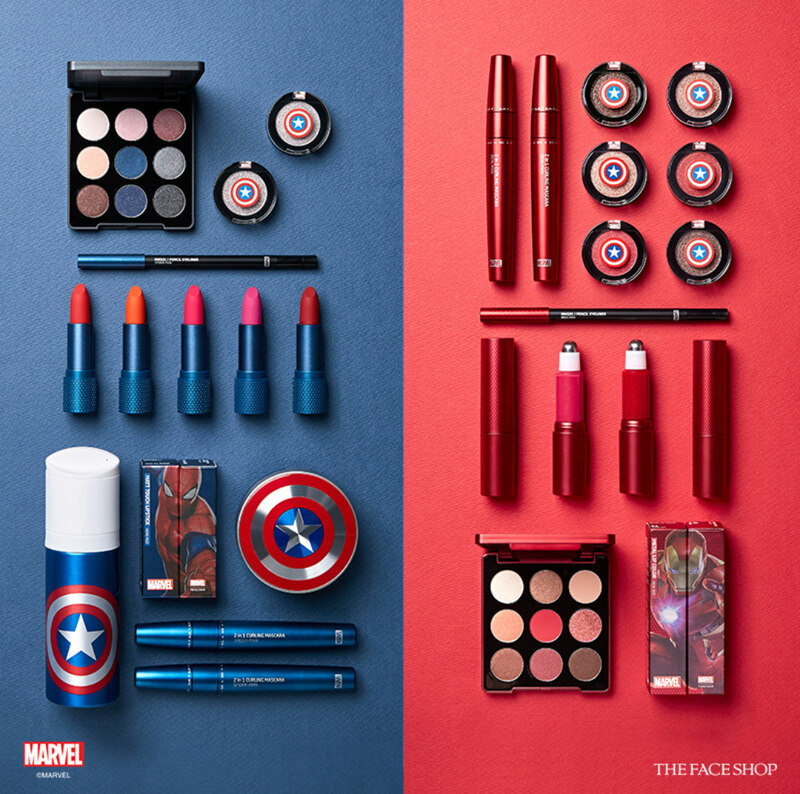 Love the Marvel/Captain America packaging too. OMMMMGGG how cute! 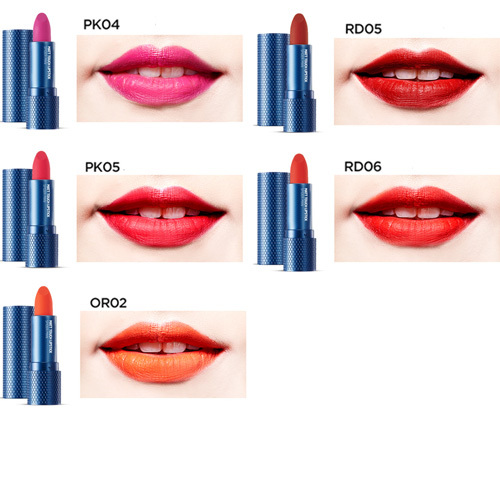 I litereally want them all, I barely wear makeup but I want to just throw money at these. Aww! 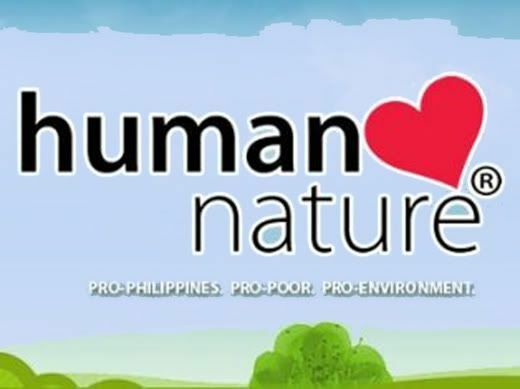 Is it ever going to be available in the PH? 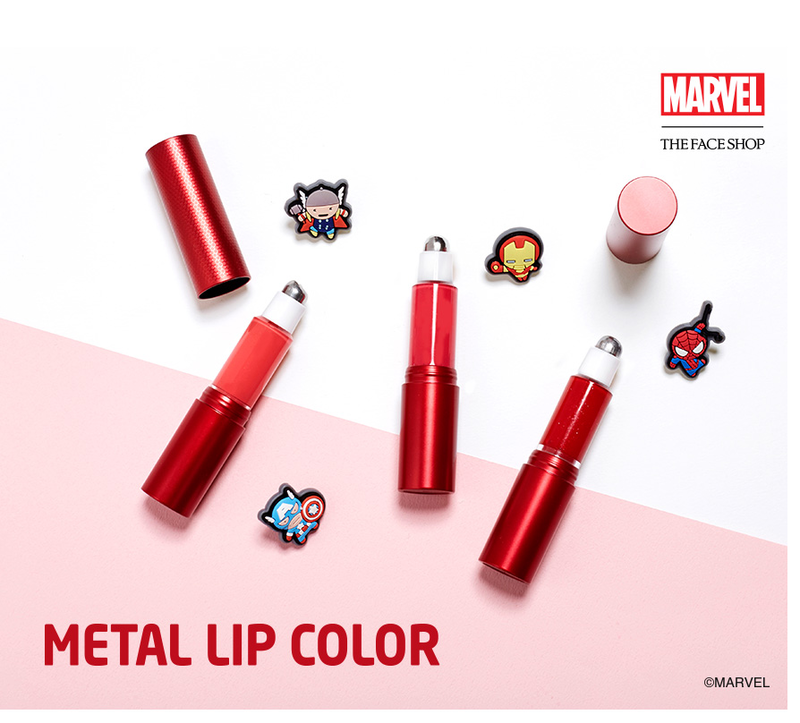 I think it's awesome that they did a collab with Marvel. These are SUPER awesome products especially the mascaras and the lippies! It really is a cool collection. 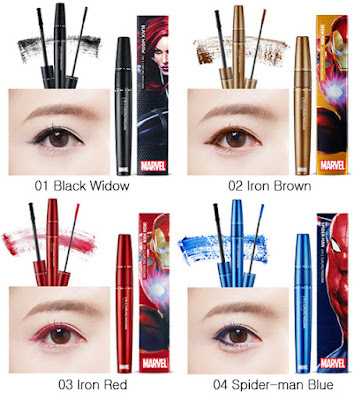 The Spider Man Blue mascara and gel liner looks fab, def. my favorite!